One has to be careful about wishes! Last week, one dog eventually got outside. Someone accidentally let him slip out the door while the owners were away. The backyard fence was down, so the dog felt free to escape the property. As I walked my daily rounds along the road in front of the dog’s home, it suddenly flew at me from the backyard. It seemed to be shot out of a cannon, barking an ominous loud, angry bark. I had all of three seconds before it was on me. Not knowing what to do, I kept walking up the road. The angry protective canine got behind me and chomped down on the back of my knee. Ew, that hurt! I screamed but no one was around to hear me. Luckily, he didn’t bite me again. I ran to another neighbor’s home and pounded on the door. That neighbor was home and he generously helped me. I’m feeling better now. The bite is healing without infection, the dog doesn’t have rabies, and I am out doing my daily power walking rounds again. This incident was bad for my heart because of the fear, pain, and shock of being bitten. But it was also good for my heart because the neighbor, dog owners, and many others reached out generously to help me. 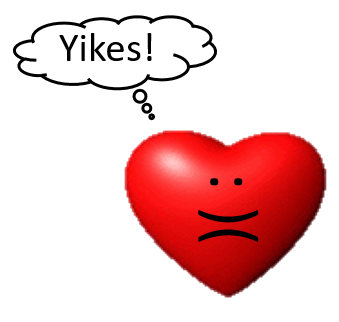 Have you had an experience that was bad and good for your heart? Next Article Where Are You? Thank you, Holly. I appreciate your input! Glad the bite didn’t get infected – that whole thing about a dog’s mouth being really clean isn’t true! Glad you’re ok.
Victoria, I agree any mammal’s mouth is full of germs. I went into high gear using peroxide and antibiotic ointment. Success, whew! I am so glad that you are healing with no infection. And I hope you are carrying protection on your walks from angry dogs or any other threats. You are an inspiration for me to keep moving. I agree with Jeanne that you are an inspiration to keep moving. Even through a scary experience, you survived with rising above your fears and pain. Glad to hear you are OK now.